I’m jotting a note on behalf of fellow G3S member Eddie Williams, who has had problems with trying to post. 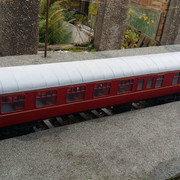 Eddie has been beavering away developing resin Mk1 coach kits for a good part of the past year. Now that he has perfected a few tricky features like window frame shape and projection, glazing, seating, underframe, dynamo, etc, etc, he has asked me to mention that some kits of BSO and SO should be available at the AGM. He is wondering what sort of uptake, if any, there might be. Hopefully Eddie can get online soon and give some more details of pricing, future diagram numbers, types of lighting (tungsten or fluorescent), etc. I would just add though, that the quality from what I have seen is first class, and with the variety of body styles planned there is no reason why all trains should comprise just Kingscale SKs! 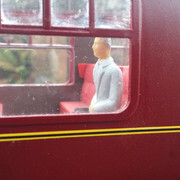 Eddie has just supplied a couple of pics to illustrate the general approach of the BSO, but cautions that this is an early prototype that had some window dimensional errors, now corrected in the new moulds. Rigidity and freedom from distortion have been sorted though, so it was a useful development model. Well Eddie you have done a superb job. I will hopefully be after an SO. i'm sure these mk1's will be more like a price we'd really want g3 stock to be and foresee a situation,similar to g1 where many members may have a couple each and get togethers see trains made up from a collective of individuals to bring realistic length trains for some of the large locomotives we have to pull them. Prices are as follows, for a basic resin kit £150. This includes, (one piece underframe,floor,solebars,buffer beams), trussing, battery boxes, dynamo, brake cylinders, internal partitions, side panels, the outer panels have the corrosion strips, hinges, door stops molded in, door handle positions marked, 4 aluminium support bars which run the length of the coach, 26 roof panels, catches for the roof to remove it, corridor connectors, no rigid, but molded seperate. The first 2 kits which i will have available for the agm are the BSO and SO. The underframe and tims bogies have been designed to cope with 8 foot radius, which works well on my own layout. I designed this kit as im an avid mk1 coach fan, there will be more variety to come, with add on detail kits later in the year, such as pipework, foot steps and lighting modules, i am also working on the shorter underframe, which will be used for my 108 dmu, suburban and full brakes, which will also be available as kits. Sorry, quick correction there, the corridor connectors are non flexible, not not rigid! However, they are molded seperate from the end panels, as at some point, im going to make flexible ones, there is also seating. 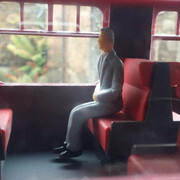 The seating is based on the third class, which was then quickly uprated to second when third was abolished a year later, it consists of a cushion, head rests, base and side panel, this can be used for the second open coach and bso. The seating kit is £20, which covers my costs, they use quite a lot of resin! All the parts to these kits are drawn out on cad then 3d printed, cleaned up and molded, the coaches to my best efforts, are accurate given the constraints of the materials used, and information available, measurements have been taken from the real thing, and lots of books, drawings, photos ect, i could in theory make any of the mk1 coaches, if anybody has a preference for another type, im open to ideas, the kits available at the moment will be a rolling production, so i will try and keep 1 of each type in stock, if somebody requires a few at once, i will make them up to order, im not making say a batch of 50, then stopping production, so they will be available for the foreseeable future, i also dont plan on selling ready built and painted kits at this moment in time either, as i dont have the space to assemble them, however, once i move to a larger house, hopefully this year or next, i will have some more space for doing just that.